Lock in a great price for Anatoli Hotel – rated 9.1 by recent guests! One of the highlights of the whole Greece trip. Hotel was stunningly beautiful, clean and spacious. Had the room with balcony and the view to the pool and old town. Free shuttle to and from the ferry. Amazing family owned place. Super friendly staff and breakfast was always fresh with huge selection of local goods. Has Sauna and Gym as well. Very nice and clean hotel. Nice pool, good breakfast with lovely home made pastries. It is located out of the centre, a walk of about 20 minutes. Very friendly family who makes you feel welcome. We loved our stay! The staff is so sweet. Their big pool after a long day of exploring was perfect way to end each day! About 15 minutes walk to main area and port. Breakfast was perfect and fresh. Very clean hotel! The best part of staying at Anatoli Hotel is the service from the staff; they were eager to make our stay as pleasant as possible. The breakfast was plentiful and delicious and they provided rental cars for us that were easy to reserve and use. The pool was fantastic, very clean and large enough to swim lengths, very refreshing! The hosts were kind enough to pick me up at the port and drop me off there as well, which was very gracious of them. Breakfasts were exceptional! Maria!! A truly lovely host that brought us two glasses of orange juice to the lobby while we checked in. Then, she gave us kitron while we relaxed in the hot tub after arriving late due to a public transit 'adventure'. Throughout our visit, she seemed genuinely concerned about our well-being and happiness. 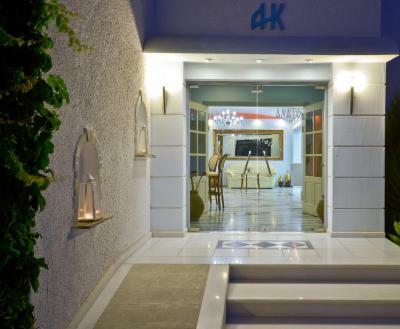 Very clean facilities, pool, garden, sauna, and gym. The breakfast buffet - baked and prepared by Maria - was delicious. Incredibly reasonable rates and great space to relax. Great family run hotel. Nice pool, great breakfast, friendly staff. 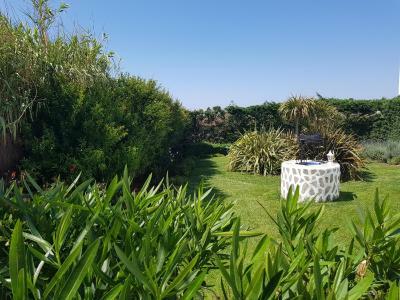 In a quiet area, in easy walking distance of port area. Free shuttle to/from ferry and airport. Lovely room and facilities, good breakfast. Very helpful staff (family run), they provided lifts from/to port, as well as arranged quad and car hire for us, the dog Miguel was a dote :) would def recommend! I enjoyed my stay here. The owner, Stravos, was very kind and provided all the information I needed to enjoy my stay. He even got me a rental car within 15 minutes of my arrival. Highly recommend this property. The staff is always there for you, that's amazing. The room was spacious but a little bit cold. By walking you can go to downtown and visit the castle and Apollo's monument. 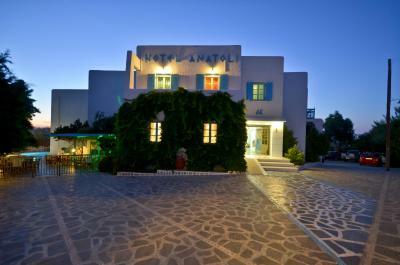 One of our top picks in Naxos Chora.Anatoli Hotel combines the Cycladic architecture with a modern style. 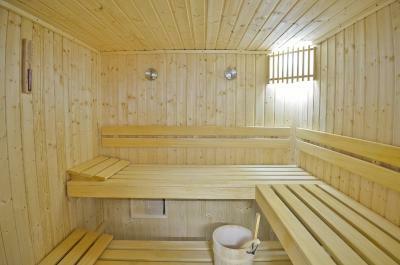 It features free Wi-Fi, an outdoor pool, gym and sauna. It is a 7-minute walk from the center of Naxos and Agios Georgios beach. The rooms and apartments come with air conditioning, satellite TV and a fridge. 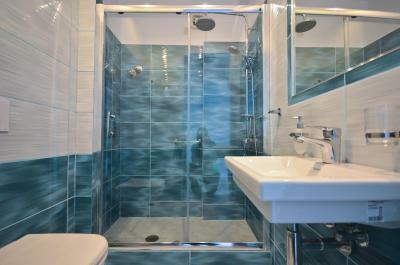 Each is fitted with a private bathroom and balcony. Some units offer views of the garden or pool. A buffet breakfast is prepared daily. The on-site café and bar serves various hot beverages and refreshing drinks. Anatoli Hotel is close to the harbor, various fish restaurants, taverns, cafés and bars. Naxos Airport is at a distance of 2.2 mi and the port is at 0.6 mi. Free transfer to and from the airport or port is available upon request. Air-conditioned room with a satellite TV, fridge and free Wi-Fi. Featuring a kitchenette with fridge, this air-conditioned apartment offers free Wi-Fi and a satellite TV. Please note that this room type has no balcony. At Naxos, one of the most beautiful islands of Cyclades, with the exotic sandy beaches, our hotel is situated, Hotel Anatoli. 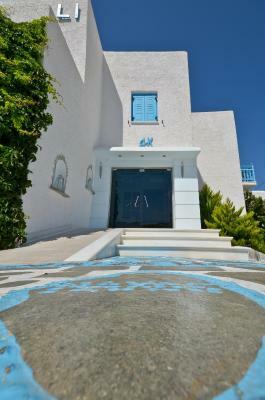 The hotel is at the capital of Naxos, named "Chora" and only 7 minutes away from the port, airport and St George's beach. 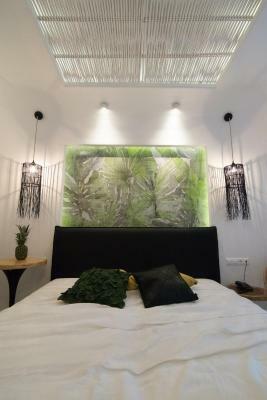 Spacious rooms, bathroom, Air condition, fridge, telephone and veranda to enjoy your evenings at the sun rises. The hotel also has a pool, room with TV, dining room and bar. The mini bus of our hotel will always be available to carry you to the airport or to the port for your comfort. 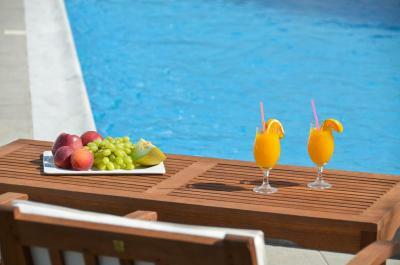 The friendly atmosphere and the excellent service will guarantee you memorable vacation. Everyone and everything was wonderful! Beautiful view, friendly and helpful staff, good breakfast, the room and grounds are both lovely! Better bedside lights and stronger coffee. Very helpful and friendly, family run small hotel with homemade breakfast dishes, hot tub, balcony with open aspect. Free transfers to and from ferry. 3 adults in room. 2 adult beds. 3rd bed was for a child and shorter than the other 2 beds. This made it uncomfortable for third adult in room. Amazing breakfast and really great value for the money. We loved the family feel to the establishment. The breakfast room is quite crowded and difficult to negotiate, but this is a small problem. Other than this the place was perfect. We had a wonderful stay here. We were picked up at the port by Stavros, at no charge, and given juice and homemade cake when we checked in. The family that run this hotel were very helpful. We were upgraded to an extremely comfortable new one bedroom apartment. It was very comfortable for our 4 night stay. It was 5 minutes walk to the nearest beach and 10 minutes into the old town. It was about 15 minutes to the public bus terminal. You could have rented a car from the hotel if you wanted but we were happy to walk and catch the buses. They were very accommodating when all the ferries were cancelled because of a storm and offered to ring our next hotel to tell them about our change in plans. The breakfast was tasty with many homemade items, though not much fruit. The pool and spa were really nice and clean. They offer a very good same day Laundry service for 10€. Great family run hotel. Breakfast was excellent. The staff were extremely friendly and helpful. A great value for your dollar. Will recommend it and stay there again should I ever visit Naxos in the future. Clean room. Nice view from the balcony. Very good breakfast with variety of homemade dishes and tasty cakes. Great staff, very good breakfast. I really like this place. The staff were excellent and very courteous. The pool and sun beds were of high quality in that the pool was kept very clean and the sun beds were very comfortable.